Labor Day Weekend is finally here! We all work so hard throughout the year, sometimes it’s nice to feel appreciated and receive something in return. That’s why we’re giving all of our loyal customers and fans Free Shipping on all orders over $99! 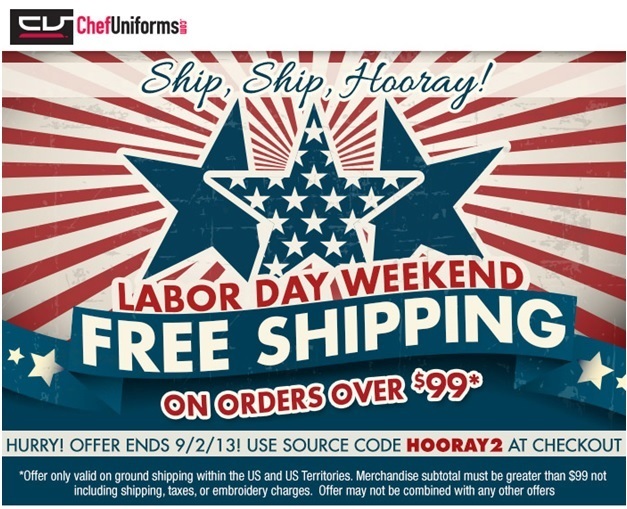 This offer won’t last long, so be sure to take advantage and pick up a new chef uniform before 9/2/13 at midnight, EST! Simply enter the source code HOORAY2 at checkout. Also, if you haven’t participated in our Photo Contest yet, it’s not too late! Simply follow the instructions below, and you could be one of two lucky winners to receive a $100 E-Gift Card to ChefUniforms.com! Good Luck!